A few months while at work I decided to buy a couple of piggy banks to start saving change. I bought 3 for myself, and decided that I would put one up and use the other two for my quartes, dimes, and nickels. Yesterday when I went to my room to add change to my banks, I looked over at the “pennies” which was on my night stand, while the quarters, dimes and nickels “sit in a lovely glass piggy bank, on the entertainment stand. I thought to myself, how easy it is for us to discriminate. When I thought about what I didnt like about pennies, and why they were sitting seperate from my other coins, I realized that ‘I felt” they didnt have as much value as the others did. They seem to be a “pess” always on the floor being stepped on, just in the way. But that gives me no right no mistreat them. They are all coins, why should they sit in a corner somewhere? Would I want someone to do me that way? No! Its a shame how easy we discriminate. I’m guilty of it just with the change I have. I can even remember one day this week, one fell and I just looked at it, never bending down to pick it up. Had it been a dime, quarter, or nickel I would have snapped my knees trying to get to it. That ole piggy I put up, Im going to get it out and begin saving pennies. I love pennies. 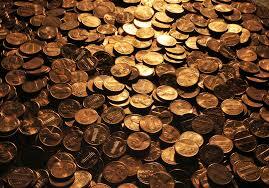 Now that I think about it you can find a penny faster than you can find a quarter, dime or nickel. How dare I mistreat a penny and put them on a scale against the other coins. So my question to you is, what can you think of NOW, that you discriminate against? What are you going to do about it? Has this helped you to be more aware ? 8If you really keep the royal law found in Scripture, “Love your neighbor as yourself,” you are doing right. 9But if you show favoritism, you sin and are convicted by the law as lawbreakers. 10For whoever keeps the whole law and yet stumbles at just one point is guilty of breaking all of it. 11For he who said, “Do not commit adultery,” also said, “Do not murder.” If you do not commit adultery but do commit murder, you have become a lawbreaker.